HI! It has been a while since I’ve posted. Let me explain what has been going on. I feel like that ever since the beginning of the year, I’ve been re-examining my photographic presence online. How do I emphasize my best work but still participate socially with people? How do I decide what goes out if anything. Should I do less on social media or more? Then, there is my work inside of The Arcanum. It’s has been stretching my idea of what is good photography. What makes for a good crop? How to shoot in the first place? What is my style? What should I focus on? These are all lofty questions. I was beginning to doubt myself quite a bit. But yet, at the same time, I continued to shoot more and more photos. I continued to make images. But I wasn’t sharing them publicly very much. I was basically outside of my Arcanum cohort only sharing with my very closest people, my identical twin and my mom. Now, this isn’t as bad as it sounds. My mom and brother both like taking photos and are actively trying to improve what their photography, too. But, there is this wonderful little activity I participate in called, Drink and Click. It’s a monthly contest of photographers from many metropolitan areas from around the world. Locally, two participants that have impressed me very much are Lauri Novak and Deirdre Hayes. (If you don’t know who they are, I highly encourage you to find out about them and follow them.) Both of them have very different approaches to their photography. I do not want to undersell the additional talents I’ve shot with during Drink and Click. There are some great photographers in the Chicago area. During the April, June, and July events, some of these photographers had observed that I don’t post a whole lot. I couldn’t deny that they were right. I knew it was a sign that my photography as a whole was being questioned internally. I just didn’t know how I wanted to continue! I knew that I had to share! What did I share? Well, I had enough! I needed to get a lot of my stuff out. There was and still is a lot to share. I decided to use Facebook more than ever. Many of my photos will be shared on my personal page. Of course, you can view my page that shows my social media profiles. I’m all over the place! Also, G+ is going to see more posts, too. As I get used to sharing more, I will also use 500px, and viewbug to gauge my performances compared to others. I have also started a new account on www.finartamerica.com. I’m not sure how that will go, but we’ll see. 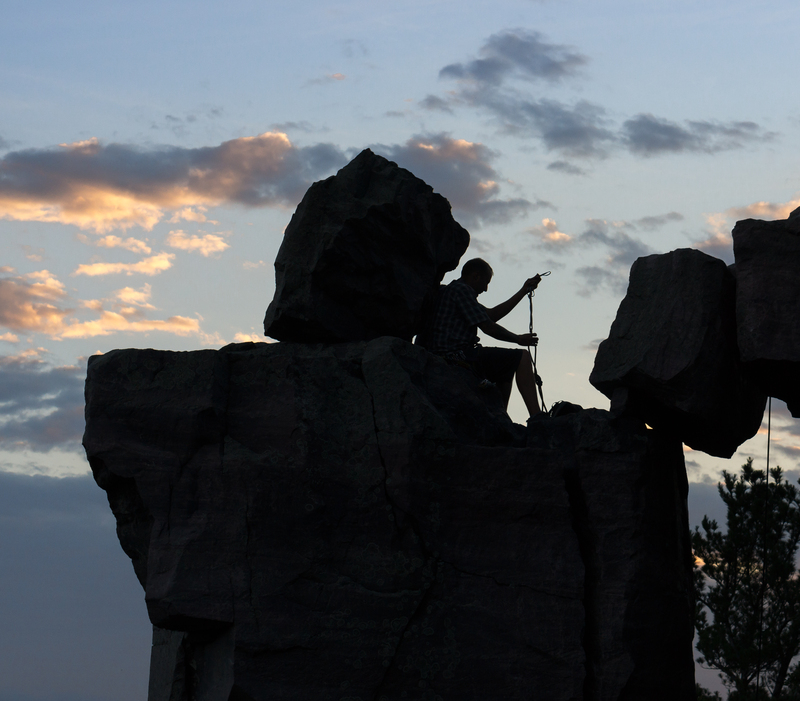 This rock climber was preparing to descend Devil’s Window rock formation in Devil’s Lake, WI. For now, I’ll be focusing more and more on Chicago. I’m hoping to capture more city life in more interesting ways. But, why not one more skyline shot before I close? Take care, and I hope to see you again next month.